United Cutlery sponsors a Fantasy Knife of the Year series designed by former Alaskan hunting guide Gil Hibben, and this Immortal Knife was 2007's featured blade. No longer in production, the knife was limited to only 3,000 pieces. Each knife includes a sheath and a Certificate of Authenticity autographed by Hibben, creator of the famous Rambo Bowie. The Hibben Immortal Knife features a 15-9/16-inch, double-edged willow leaf blade of high carbon 420J2 stainless steel, polished to perfection. The knife's rat tail tang passes through a chrome-plated cross-guard of solid cast metal and terminates in a matching spiked "skull crusher" pommel. Ornamentation on the cross-guard emphasizes its rectangular shape and contrasts with the spiral hand grip of synthetic amber bone. Three sets of barbs near the base of the blade show the same symmetrically-ground false edges as the main part of the sword. It's a well-balanced short sword with a very lethal appearance and would make a fine display piece. Each section of the knife shows fine detailing -- such as the silvered wire braid inlaid in the spiral grooves of the knife's grip. The black stitched leather belt sheath, embossed with fantasy symbols and reinforced with black lacing, also shows the outline of a Gil Hibben Bowie knife on the security strap. No display stand is included with the purchase, but showing off this short sword shouldn't be a problem. This one's good enough to keep where people can look at it closely. 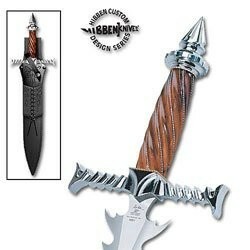 See the Gil Hibben Dragon's Lair Sword for another fine collectible from United Cutlery.